New vehicle infotainment systems take drivers’ eyes and attention off the road and their hands off the wheel for potentially dangerous periods of time, according to new research from the AAA Foundation for Traffic Safety. Drivers using in-vehicle technologies like voice-based and touch screen features were visually and mentally distracted for more than 40 seconds when completing tasks like programming navigation or sending a text message. Removing eyes from the road for just two seconds doubles the risk for a crash, according to previous research. With one in three U.S. adults using infotainment systems while driving, AAA cautions that using these technologies while behind the wheel can have dangerous consequences. AAA has conducted this new research to help automakers and system designers improve the functionality of new infotainment systems and the demand they place on drivers. The AAA Foundation for Traffic Safety commissioned researchers from the University of Utah to examine the visual (eyes off road) and cognitive (mental) demand as well as the time it took drivers to complete a task using the infotainment systems in 30 new 2017 vehicles. Study participants were required to use voice command, touch screen and other interactive technologies to make a call, send a text message, tune the radio or program navigation, all while driving down the road. Researchers developed an advanced rating scale to measure the visual (eyes off road) and cognitive (mental) demands and the time it took to complete a task experienced by drivers using each vehicle’s infotainment system. The scale ranged from low to very high levels of demand. 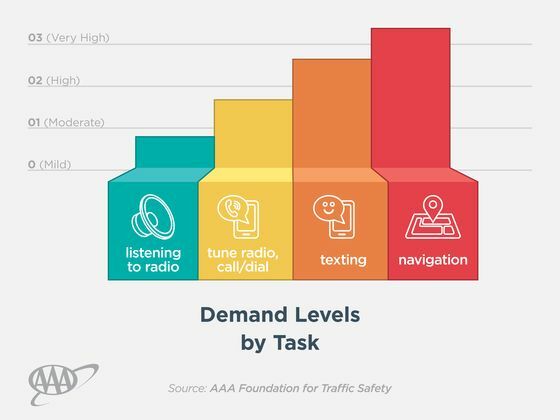 A low level of demand equates to listening to the radio or an audiobook, while very high demand is equivalent to trying to balance a checkbook while driving. AAA believes a safe in-vehicle technology system should not exceed a low level of demand. 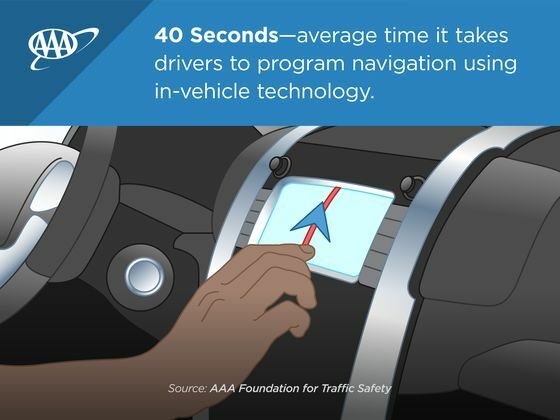 Programming navigation was the most distracting task, taking an average of 40 seconds for drivers to complete. When driving at 25 mph, a driver can travel the length of four football fields during the time it could take to enter a destination in navigation—all while distracted from the important task of driving. Programming navigation while driving was available in 12 of the 30 vehicle systems tested. “We are sharing this research to help automakers improve the designs and functionality of new infotainments systems to keep drivers safe,” continued Podguski. Frustration resulting from unsatisfactory use of these systems increases cognitive demand and increases the potential for distracted driving. According to a new AAA public opinion survey, nearly 70 percent of U.S. adults say that they want the new technology in their vehicle, but only 24 percent feel that the technology already works perfectly. Moreover, researchers found that most infotainment systems tested could easily be made safer by simply following clearly stated federal recommendations such as locking out text messaging, social media and programming navigation while the car is in motion. In 2012, the National Highway Traffic Safety Administration (NHTSA) released a set of voluntary safety guidelines advising automakers to block access to tasks when vehicles are not parked. A total of 120 drivers ages 21-36 participated in the study of 30 new 2017 model-year vehicles. The latest report is the fifth phase of distraction research from AAA’s Center for Driving Safety and Technology. The Center was created in 2013 with the goal of studying the safety implications for how drivers interact with new vehicle technologies when behind the wheel. Visit AAA.com/distraction to learn more. About AAA Foundation for Traffic Safety: Established in 1947 by AAA, the AAA Foundation for Traffic Safety is a not-for-profit, publicly funded, 501(c)(3) charitable research and educational organization. The AAA Foundation’s mission is to prevent traffic deaths and injuries by conducting research into their causes and by educating the public about strategies to prevent crashes and reduce injuries when they do occur. This research is used to develop educational materials for drivers, pedestrians, bicyclists and other road users. Visit www.AAAFoundation.org . AAA East Central is a not-for-profit association with 81 local offices in Kentucky, New York, Ohio, Pennsylvania and West Virginia serving 2.7 million members. News releases are available at news.eastcentral.aaa.com. Follow us on Twitter and Facebook.